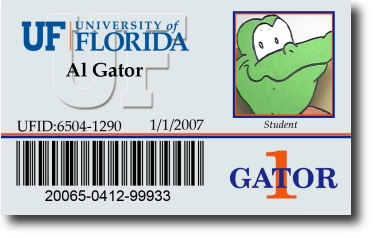 UF ID Card Services has two locations. The main branch is at the UF Bookstore & Welcome Center and the other is in the Medical Sciences Building at the Health Science Center. Monday through Friday - 8:00 a.m. to 6:00 p.m.
3-4-19 8:00 a.m. � 3:00 p.m.
3-5-19 8:00 a.m. � 5:00 p.m.
3-6-19 8:00 a.m. � 5:00 p.m.
3-7-19 8:00 a.m. � 5:00 p.m.
3-8-19 8:00 a.m. � 5:00 p.m.
3-11-19 Resume Normal Business Hours of 8:00 a.m. to 6:00 p.m.
Monday, Wednesday & Thursday 9:00 a.m. to 12:00 p.m. & 12:30 p.m. to 3:00 p.m. This page was last updated on 2/25/2019.